The Ambassador Bridge is a suspension bridge which spans the Detroit River and joins the Canadian side at Windsor, Ontario with the American side in the city of Detroit, Michigan. Construction of the Ambassador Bridge began in 1927 and has become the busiest international crossing throughout North America. Completed in 1929, the Ambassador Bridge has a total length of 7,500 feet and is made of steel except for the two main towers which are made of a steel-silicon alloy rising out of the concrete bases. These towers rise to 386 feet above the Detroit River and go beneath the surface for about 115 feet. Being a crossing for approximately 10,000 commercial vehicles on weekdays, transportation for Canadians and Americans have become simplified over the years. 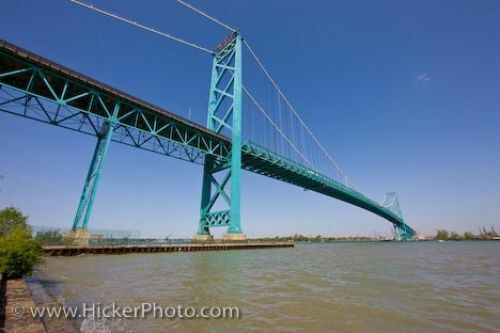 The Ambassador Bridge has been seen in many television films and series, making it a bridge easily recognized. Picture of the Ambassador Bridge joining the Canadian location of Windsor, Ontario and the American city of Detroit, Michigan. Ambassador Bridge spanning the Detroit River between the cities of Windsor, Ontario, Canada and Detroit, Michigan, USA.